Hitler’s Personal Mercedes-Benz Set For Auction, Could Sell For $7 Million. Of all the cars we’ve seen cross the auction block this year, this is by far the most controversial. While cars with celebrity connections will always be popular, we doubt many will want to own a car with Adolf Hitler on the previous owners’ list. You could, however, argue that this car is historically significant. 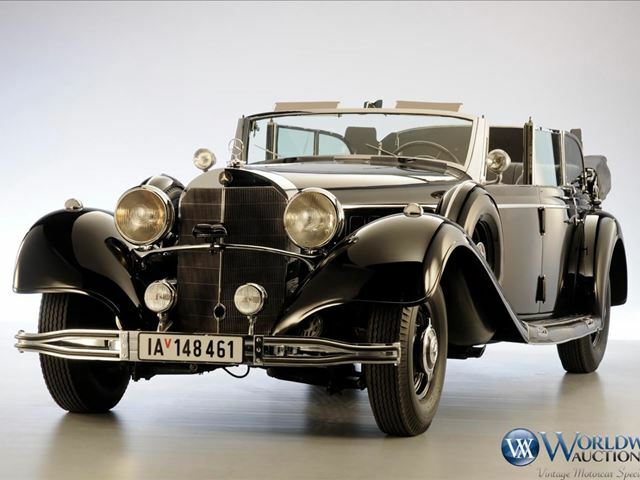 Heading to the upcoming Scottsdale Auction via Worldwide Auctioneers on January 17 is this 1939 Mercedes-Benz 770K Grosser Offener Tourenwagen that was used by Adolf Hitler during Nazi parades between 1939 and 1941. According to the listing, Hitler’s personal driver Erich Kempka chauffeured the dictator through the streets of Germany in this very car during World War II. No estimate has been given, but Worldwide Auctioneers will be donating 10 percent of proceeds from the auction to Holocaust education. Similar to modern armored vehicles that transport presidents and government leaders, this Mercedes is loaded with protective gear. The sides and bottom of the car are armor plated, and the windshield is bulletproof to protect passengers from any security threats. A protective partition can also be raised behind the seats to deflect any gunfire. Equally impressive is the Mercedes 770K’s standard equipment. It’s powered by a supercharged 7.7-liter inline-8 producing 230 horsepower connected to a five-speed manual transmission. It’s a shame about the previous owner, because this is clearly a well-preserved and beautifully engineered luxury car but we imagine a lot of people will have reservations about owning a car associated with Adolf Hitler. I hope the new owner has respect…..and burns it!